This article was also published in Meridian Magazine. Finding names for the temple is now easier than ever by viewing your family tree from a different angle. Using the Descendancy view of Family Tree, you can see which of your cousins may still need to have temple work done. Sign in to FamilySearch.org and click Family Tree along the top of the page. In the upper left corner, click the arrow next to Landscape and choose Descendancy (as shown in Figure 1 to the right). To the right of Descendancy, click 4 after the word Generations to display 4 generations on the page (as shown in Figure 2). 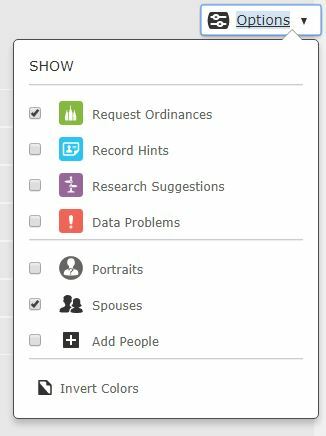 Click the arrow next to Options at the top right of the screen and select Request Ordinances. Click Expand right above your name and select an ancestral line that you want to view. Continue expanding different ancestral lines until you find an ancestor who needs temple work, indicated by a green temple icon (like the one shown in Figure 4).